Includes all original parts, including instructions and kit bag. Incredibly well made and so it is in full working order in spite of its age! 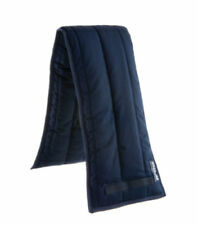 There is a repair to one of the fleece covers but it does not affect the function at all. Natural Horsemanship Corde Dos Nu et longue ligne. Taille unique. Halter in a good used condition. Castle Training Roller. Fleece lined. Super comfy for your horse. Chambon Training Aid. Used and been stored for a while. Dispatched with Royal Mail 1st Class. Soft Nylon Crupper. Nylon, fully adjustable with padded acrylic dock. 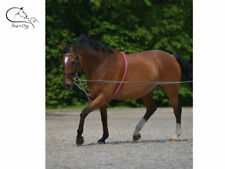 We own horses of our own and have over 30 yrs of experience in the equine world. Colour: Black. Pony Size Red Neck Strap. Condition is Used. Dispatched with Royal Mail 2nd Class. Black cob/full Martingale breastplate /black brass clips good condition . This auction is for a Dever Market Harborough, Havana, size Cob/Full. English leather In VGC, cost £99.95, no longer needed. Adjustable Apollo Rubber Ring Side Reins. Condition is New. Dispatched with Royal Mail 2nd Class. Sheldon Cushion Web Lunge Rein. Condition is new. Never been out of the packet, 8mtr, purple/neon green/red, packet is dusty, never used, been thrown in a box and forgot about. The PVP BungeeBand Saddlepad is a training aid that can be used either on the lunge or under saddle. It is fully adjustable so you can increase the tension as you feel necessary. A fantastic aid to get your horse engaging their hindquarters and stepping through, whilst simultaneously lifting through their abdominals. BungeeBand replacement/spare bands *This only includes the bands - no buckles/webbing etc (for full DIY kit see other items) Two bands included - a hindquarter strap and an abdominal strap. These bands are cut to length to fit the full-size BungeeBand saddle pad. 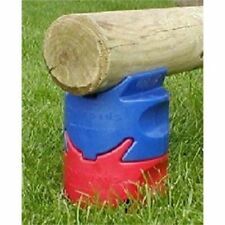 These can be cut down to size for ponies/smaller horses. They should fit the biggest horses, but if you have a supersize equine please message me with measurements. I cannot send out extra/replacement bands free of charge at a later date if the purchased ones do not fit. Black Leather And Rubber Chambon Training Aid. Condition is Used. Excellent condition. I used it when retraining my ex racehorse very successfully as recommended by others. I found it encourages the horse to work correctly without being restrictive or tight. Dispatched with Royal Mail 1st Class. 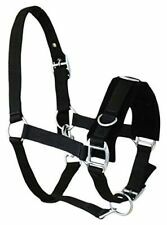 horse Riding side reins Black New. Condition is New. Dispatched with Royal Mail 2nd Class. Brown Bungee Lunging aid. Fully adjustable Used a handful of times, excellent condition. Licous de corde ne sont pas les plus jolies licous. Cependant, licous de corde sont le licol de choix pour les entraîneurs de chevaux plus professionnel. 1 x corde cheval licol. Au cours des premières années de formation. People always bought together with. SKU: KBO0039334954021102. 1 pièce récolte. Le forfait comprend. Leather Bull Whip. Here are the details. Exselle Training Aid. English Leather. Top qualité. 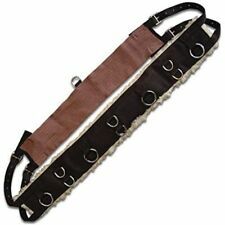 Top quality Exselle English leather training aid. Brand new. Havana brown. This is quality ...not foreign imported rubbish. Please see photos. Can send more. Pattern Levels progress check off not used. This set is not readily available now. Kerbl Rênes en toile Noir 32669. Couleur : noir. Certaines commandes ne sont pas expédiées par colis, de par leur taille et leur poids. Rênes avec des boucles en cuir souple. Îles: Nous ne faisons pas d'expédition sur les îles (Corse inclue), Monaco et les DOM/TOM -. It has a heavy duty trigger bull snap, available in brass or nickel, and a leather popper. The picture speaks a thousand words. 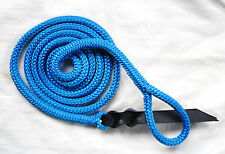 This is not a cheap imitation, just simply a better alternative to the higher priced lead ropes. Kerbl Rênes latérales 2 pcs Noir Poney 323599. Les rênes sont faciles et rapides à ajuster pendant la pratique. Taille : Poney. Couleur : noir. Certaines commandes ne sont pas expédiées par colis, de par leur taille et leur poids. Tack room clear out Used but in good condition. A black cob sized training aid, just needs a good oiling as the leather is quite stiff. Qualité 5 Point en Cuir plastron en peau de mouton synthétique NOIR & MARRON 4 Tailles!!! Kerbl Rênes latérales 2 pièces Noir complet 32660. Les rênes latérales de haute qualité de Kerbl vous aideront à entraîner votre cheval tout en lançant. Les rênes sont faciles et rapides à ajuster pendant la pratique. 22ft 12.7mm braid on braid horse training line. Nickle trigger snap hand spliced loop with back spliced end finished with a leather popper. Nice weighted rope for clear communication. Class 1 high quality braided rope and hardware. JW Training System including Roller. 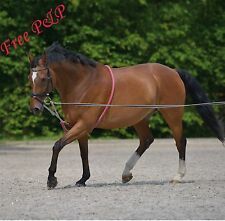 Natural Horsemanship Rope Halter and Long Line. One size.